05.07.18: The wave of exuberant hatred for the arbitrariness of uniformed individuals spills once more across the borders of France to us. For the last two nights in Nantes, hundreds of teenagers have destroyed shops, set fire to cars and attacked the CRS (Compagnies Républicaines de Sécurité / general reserve of the French National Police) with Molotovs. The police spread their version that they were in danger and it was in self-defense. It is obvious that the ‘legitimacy’ of the murder that they make public is found only in the self-created legitimacy of the police apparatus. Since we refuse to recognize that law, there can never be legitimacy for execution by a cop. It was only a few months ago that we received sad news from this region. A comrade lost his hand in the battles for the ZAD and his entire upper body is still seriously injured. An explosive grenade hit him, fired by the riot cops of the CRS. These moments, when it becomes obvious which side we stand on and which side those who wear uniforms stand, often feel like a state of powerlessness. Time stops and everything inside oneself builds up with hate and frustration. Everything either seems doomed to failure, as one is frustrated by the omnipotence of the state and the ability of the police to end a life at any time. Or, you break out of this feeling and make it visible, you release your anger, the feelings to these thoughts and show solidarity with those who are on the same page. 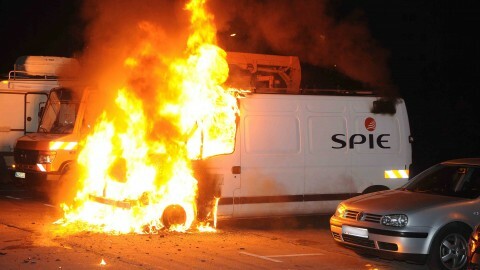 To express our solidarity with the resisters of the suburbs we torched a vehicle belonging to the prison service provider SPIE last night. The news about the use of firearms or executions by police officers due to their loyalty to the state, their mania for regulation or their racism, has also been on the rise in Berlin lately. It is permanent scandalous news that often gets lost in the media frenzy. Let’s not give our enemies a moment to catch their breath! Only a life of attack can prevent us from resigning to these power relations. In memory of all those affected by police violence! Love and strength to all prisoners in the dungeons of the state! This entry was posted on Thursday, July 5th, 2018 at 4:22 pm	and is filed under Direct Action.